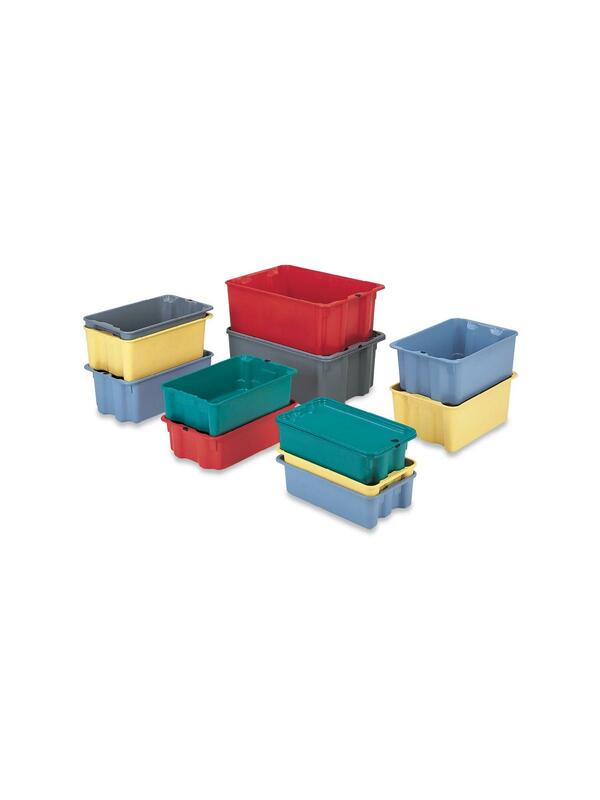 Fiberglass Plexton® Stack-N-Nest Containers | Morrison Industrial Equipment Co. Durable 500 lb. load-carrying capacity. Bottom container in a stack supports up to 3000 lbs. Stack-N-Nest containers have a uniform .1" wall thickness that provides extra strength and durability. Smooth outside surface and radius angles are safe to handle, easy and clean and have no protrusions or sharp edges. Compression molded of high strength reinforced polyester resin – provides stability and capacity to withstand extreme temperatures of -60°F to 300°F. 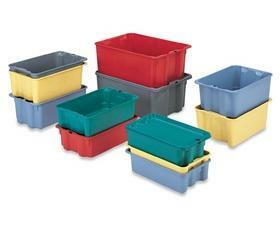 Ideal for heavy duty storage, work-in-process and distribution uses. Consistent tare weights make weighing of parts much easier and quicker. Available in Gray, Green, Red, Light Blue and Light Yellow. FOB Shipping Point. See Related Items tab for for Fiberglass Plexton® Nest Only Box Covers, Fiberglass Plexton® Stack-N-Nest Dollies and Fiberglass Plexton® Trays. ** A $7.35 CHARGE WILL BE ADDED FOR BROKEN CARTON QUANTITIES. L x W x H 17.9 x 10.8 x 5" 19.8 x 12.8 x 6" 20.6 x 13 x 8" 24.1 x 11.4 x 6.9" 24.1 x 11.4 x 9" 24.3 x 14.8 x 5.1" 24.3 x 14.8 x 8" 25.3 x 18.1 x 10.1" 25.3 x 18.1 x 6.1" 27.5 x 19.9 x 14.1" 29.6 x 13.8 x 7" 30.6 x 16.9 x 11.1" 34.1 x 24 x 8.1" 42.5 x 20.1 x 14.1"